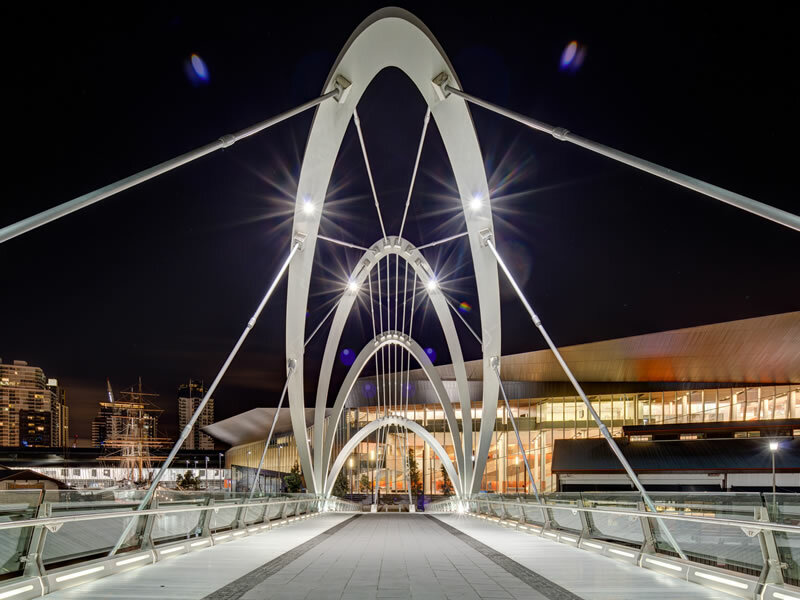 The New Convention Centre Bridge later named as Seafarers Bridge was designed and constructed for the Plenary Group (Multiplex Brookfield/Plenary Consortium) who had been contracted by the Victorian State Government, to deliver the bridge and New Convention Centre. Seafarer’s bridge provides an important pedestrian and cycle link from the Convention Centre and its associated, hotel, retail, commercial and residential development to Docklands in the north and to the north bank of the Yarra River. 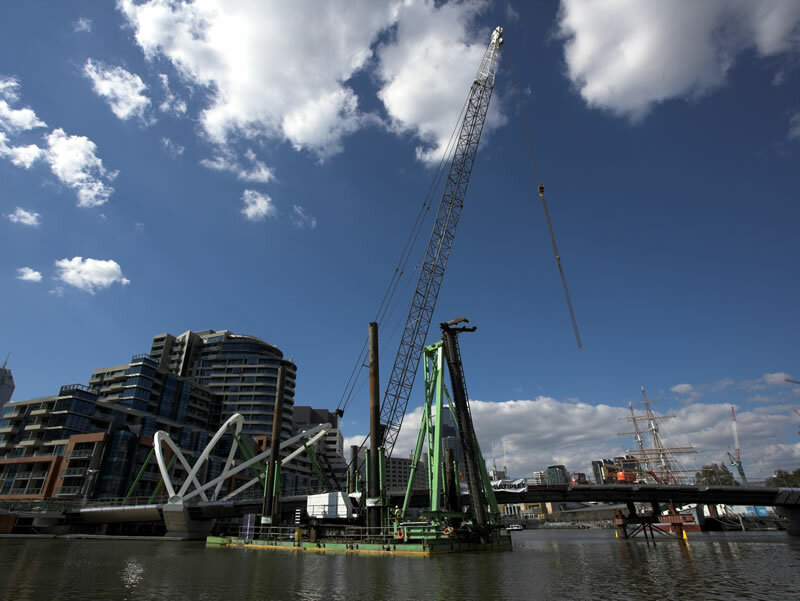 The bridge further adds a key link in the pedestrian and cycle network by connecting Docklands to Southbank at South Wharf. Combined with pedestrian and cycle paths through the Convention Centre site, links will also be created to South Melbourne. 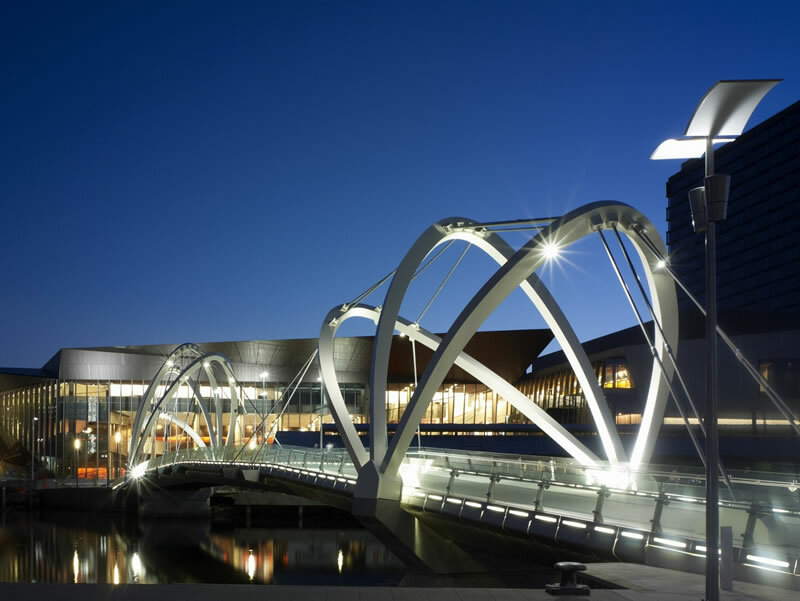 The Bridge is a striking contemporary design with a structure that minimises the visual impact upon the Yarra River yet, emphasises the area with its elegant steel structural arches. 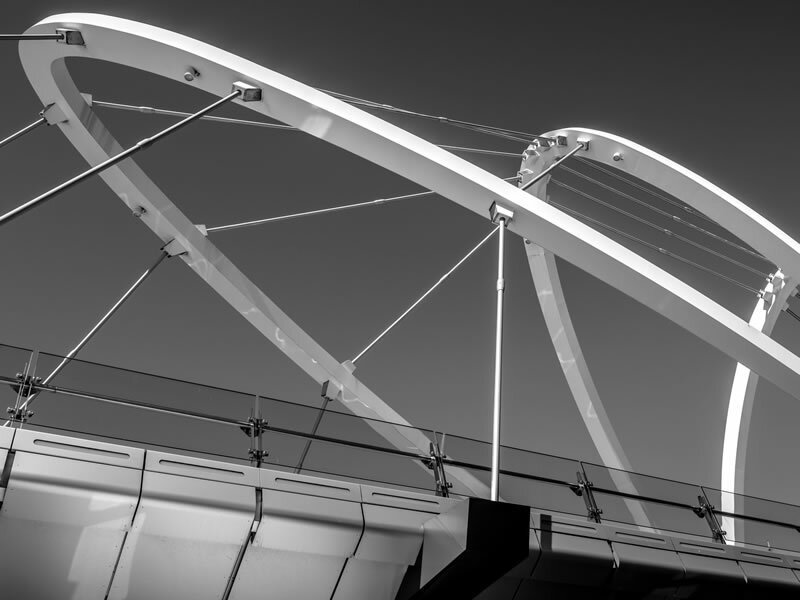 The structural design solution of the bridge has resulted in an elegant, composite steel and concrete deck spanning across the Yarra River, supported by arch-shaped steel structural members. Steel cables support the deck and link up to the steel arches above. The arch structures are asymmetrical with four arches fanning out from the south bank concrete pier adjacent to the Convention Centre and three arches fanning out from a concrete pier from the north bank. The arches lengths range from 10 to 24.5 metres. Clear glass balustrades, approximately one metre high on both sides of the bridge will mean that it will present minimal visual intrusion into views along the Yarra River. This together with aluminium cladding on the sides and underside of the bridge, compliment the slender design of the bridge. The overall width of the bridge is 8.6 metres. It is divided into two side carriageways dedicated for pedestrians, each carriageway being approximately two metres clear width. The central carriageway is 4.6 metres clear width and is dedicated for bicycles. This central carriageway can, be used for access by a motor vehicle. The design of the bridge provides clearance for river traffic which supports and introduces numerous visitors and tourists along the Yarra River Precinct. Seafarers Bridge received the Australian Steel Institute Judges Special Award 2010 and as part of the new Melbourne Convention Centre, it received the Victorian Architecture Medal at the Victorian Architecture Awards in 2010, Australian Construction Achievement Award and soon after, won the Public Architecture Award at the Australian National Architecture Awards.